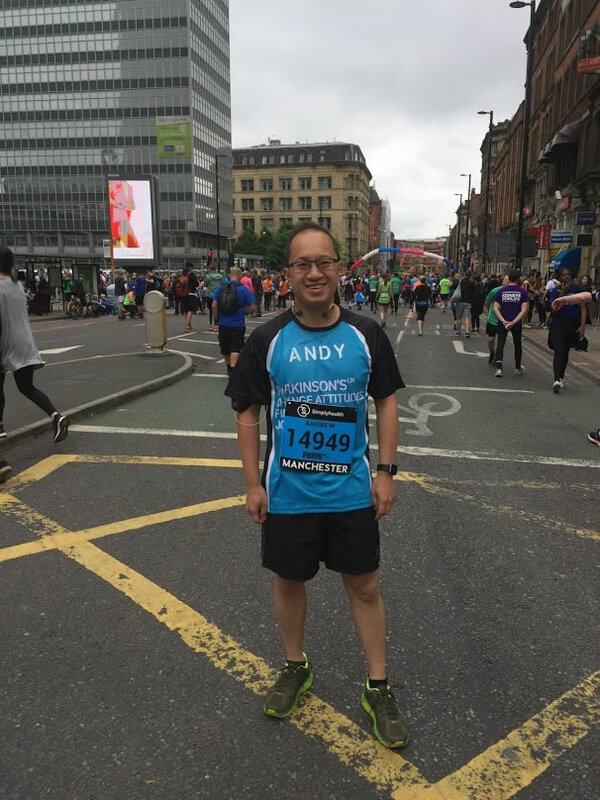 This years was the 11th Great Manchester Run I ran – 11th in a row. As the years go by I get slower, as I get older. Although I don’t really train much so that is probably a factor. But before the run on Sunday, on Friday it was the City Games. 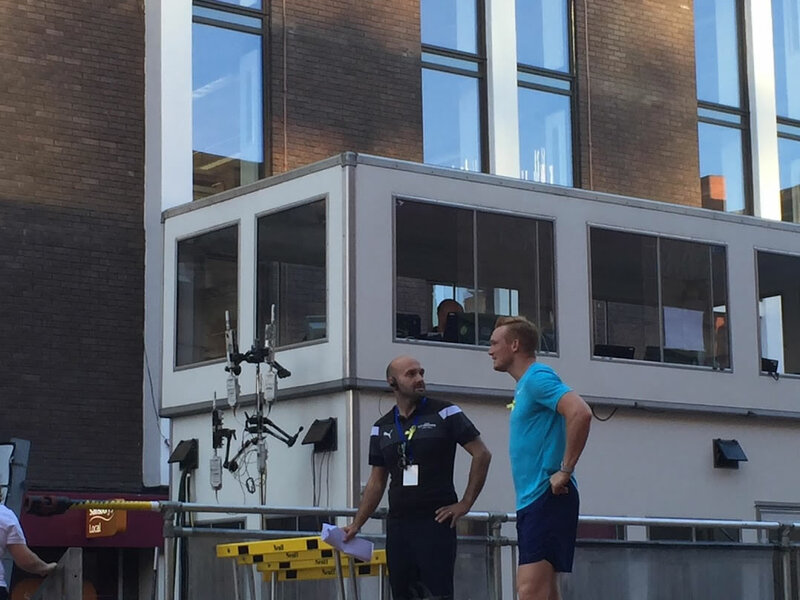 This is when sprinters run down Deansgate on a temporary track – and some track events in Albert Square. With what happened a few days before, there was heavy security around Manchester. Where I watched the running on Deansgate was right in front of a few armed police officers. But it was just as busy as normal, Mancunians coming out in big numbers! A few hours before the City Games, I bumped into Greg Rutherford around lunch time. I think he had been to the gym inside Great Northern Warehouse and was heading back to his hotel – he was staying in the Radisson. Wish I got a photo with him but didn’t – said hello and good luck. On to the actual run on Sunday. This years I was running for Parkinson’s UK so had got the t-shirt all ready with my name on it. I was in the blue wave and this started at 2pm. 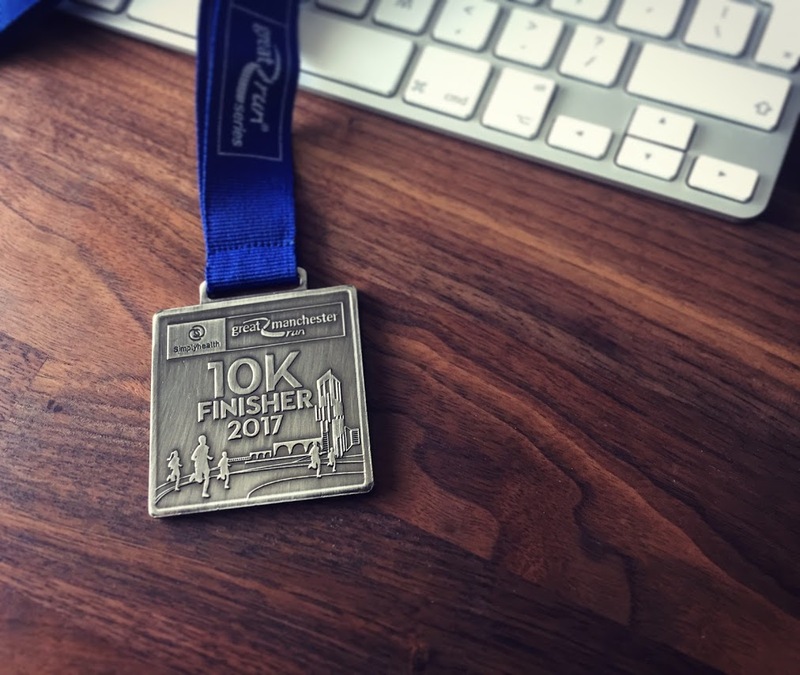 Its getting later and later every year when starting, although the main reason this years was because of the half marathon – the first year there has been a half marathon in combination with the Great Manchester 10km Run. The run went OK. It was pretty much perfect running weather – about 16C, no wind, no rain. It wasn’t till when I was around 8km in that the sun came out which was really warm. Glad it didn’t arrive earlier the sunshine! I started the run with a friend but we split straight away. I tend to try and overtake people and since its my 11th one, more used to running through the “crowds”. He overtook me I think after about a km but then I saw him again about 2km in but then lost track. I just continued and started struggling around 5-6km. Felt blisters forming on feet (turned out to be blisters, one on each foot, in the same place. Wasn’t proper blister though and disappeared after 2 days), and also tired. Since I hate running (I don’t know why I do this!) I find it easy in a way just to stop to walk for a bit. In the end, I think I started walking about 5 times if not more. For maybe about 30 seconds – 1min each time ish. Maybe I need to push myself more. Actually, and say this every year, maybe I will properly train next year. (Yes, I am thinking of doing it again next year). When I almost finished the run, with about 300m left, I bumped into my friend, who I started run with! One of us sort of joked to race and I said yes. Then sprinted with about 250m to go. A mistake to start sprinting that early and had to jog for a bit. But sprinted the last 50m or so – and “won”! 🙂 Great end to the race. After the run last thing I think about is doing another organised run, but maybe because it went OK and that end sprint, thought about doing next years. And also, my time is quicker than last few years. Its not fast I know but its alright. And also, I felt like the support from the crowds was a bit better. Maybe was, because of what happened in Manchester less than a week before the run on Sunday. Remember people shouting my name several times. My final time was 1:06:23. Ranked 11,099th. In my age and gender group, ranked 922th. 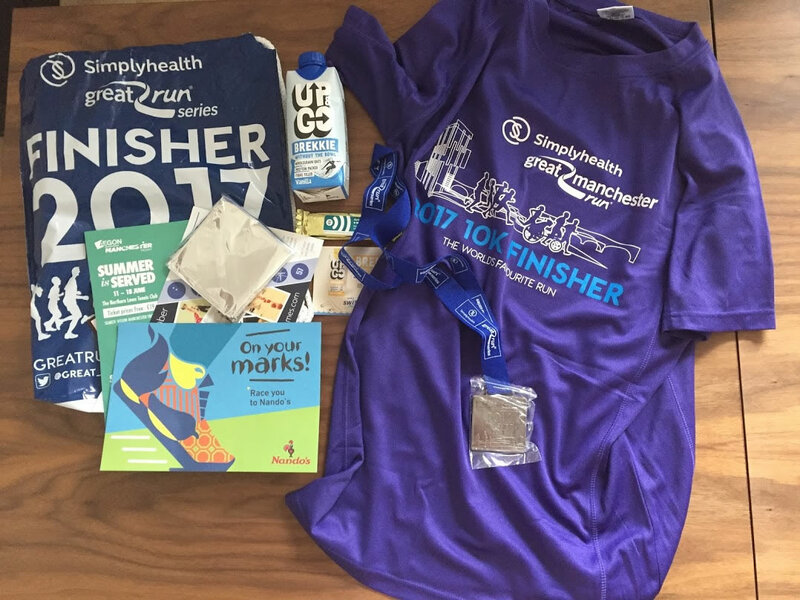 The goodie bag had the usual t-shirt and medal but expected a sport drink – there was none. And only food was a small chocolate bar. There was a voucher for 1/2 chicken from Nandos which is pretty good though.